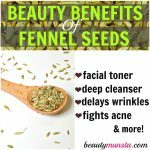 Top 10 Beauty Benefits of Broccoli Seed Oil - beautymunsta - free natural beauty hacks and more! We all know that broccoli is one of the most nutrient dense vegetable that we can nourish our bodies with. Similarly broccoli seed oil is packed with nutrients, too. 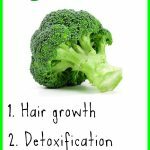 Let’s have a look at some of the amazing beauty benefits of broccoli seed oil for hair, skin and more! As the name suggests, broccoli seed oil is extracted from the seeds of the broccoli plant, a popular cruciferous vegetable. It dates back to the Roman Era because of the abundance of its growth on the shores of the Mediterranean Sea. Some historians, however, opine that broccoli was first cultivated in Italy nearly 2,000 years ago. Subsequently the plant spread to England and France in the mid to late eighteenth century. It was here known as the Italian Asparagus. Finally, by 1920, the United States commercialized the growth of broccoli. From here, we also begun to extract broccoli seed oil through cold press extraction. What Are the Properties of Broccoli Seed Oil? Vitamins A, B 6 & 12, C, D, Vitamin E (Alpha Tocopherol) and K.
Thiamin, Niacin, Riboflavin, Folate, Choline, Pantothenic Acid, Calcium, Betaine, Iron, Phosphorus, Magnesium, Sodium, Potassium, Copper, Zinc, Selenium, Manganese and Fluoride. The oil is also known to contain sulforaphane, a potent antioxidant compound found in cruciferous vegetables. Broccoli seed oil is pale green in color, non-greasy and light and is easily absorbed by the skin and hair. Buy only the best quality broccoli seed oil to get the maximum beauty benefits of broccoli seed oil. Broccoli seed oil contains the dynamic combination of glucoraphanin, glucobrassicin and gluconasturtiin. These compounds first neutralize and subsequently eliminate all toxic chemicals in the body. If you consume broccoli seed oil regularly, your blood gets automatically purified. 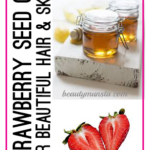 This translates to beautiful and healthy hair, plus skin. Sulforaphane, found in broccoli, activates an enzyme network for detoxification. Consequently, this protects the body’s aerobic cells from any internal damage. The antioxidants mentioned above slow down skin aging. The oil’s rich Vitamin C content enhances collagen production. Regular application makes the skin look younger. 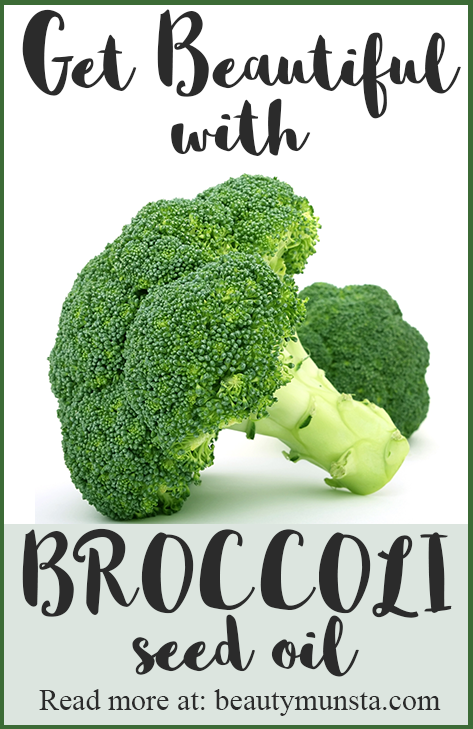 Broccoli contains a compound called nicotinamide mononucleotide or NMN. NMN has potent anti-aging properties. This makes broccoli seed oil great for preventing premature aging and eliminating wrinkles. The glucoraphanin present in broccoli seed oil converts into sulforaphane that aids skin repair. Suforaphane makes your hair shine and your skin glow. Consuming the oil, therefore, leads to faster skin cell renewal and gives the complexion a beautiful radiance. This also protects the skin from UV radiation-induced cancer. The abundance of vitamins C & K in broccoli seed oil helps in fighting free radicals that speed up your aging process. Vitamin C reduces wrinkles by improving skin elasticity. Vitamins B and C present in the oil make hair stronger by strengthening hair follicles. Moreover, since the Vitamin C in the oil fights free radicals, it also prevents unwanted hair loss. Apply broccoli seed oil to your hair and scalp to aid in the production of natural scalp oil called sebum that acts as a natural hair conditioner. 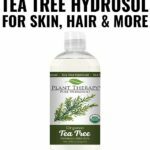 You can therefore, do away with chemical-based conditioners totally. Since the vitamin C eliminates the free radicals, it makes the thicker and healthier. Similarly, the oil’s Vitamin B content helps reduce stress that also combats hair loss in the long run. Broccoli seed oil’s unique fatty acid composition is somewhat similar to silicone that shampoos have. 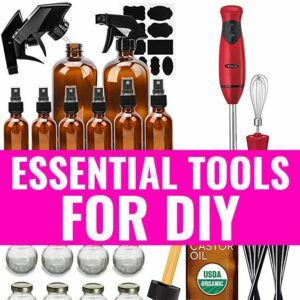 This adds a natural shine to your hair. This omega-9 fatty erucic acid not only smoothes frizzy hair but also gives it a natural sheen. Conventional hair conditioners contain plastic molecules, which are harmful for hair. The plastic content in conditioners is actually harmful to the hair and to the body’s endocrine system. With broccoli seed oil that has a unique silicone content, you can naturally condition your hair before and after shampoo. Broccoli seed oil contains omega-6 fatty arachidonic acid. 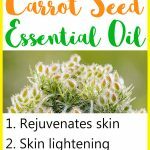 This property reduces certain inflammatory skin conditions like rosacea, dermatitis and psoriasis. Regular application to affected areas yield some very positive results. Since the oil gets easily absorbed into the hair, it forms a protective barrier around the strands. Further, the oil keeps the moisture in the hair locked in for longer periods of time.